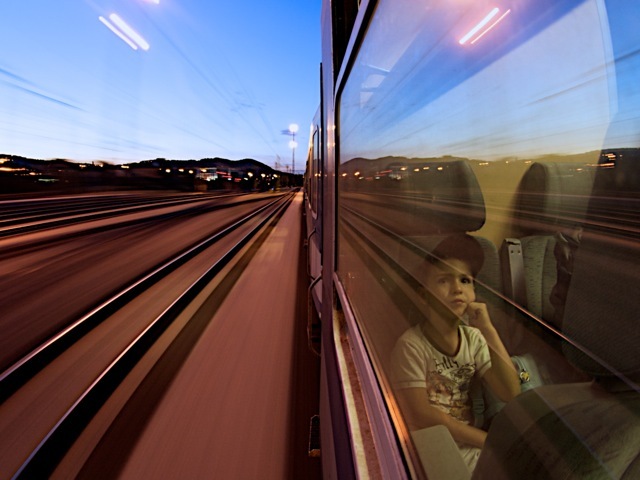 Andy Kunz argues that high speed rail is the future of transportation. Photo by Potyike. From China to Spain to Saudi Arabia, it seems that countries can’t build high speed rail (HSR) fast enough. So why does it seem like the United States of America is on the slow train? I spoke with Andy Kunz, President and CEO of the US High Speed Rail Association, to get his perspective on the future of high speed rail in America and why high speed rail is an important investment in the 21st century. He shares his thoughts on the nation’s first bullet train breaking ground this summer in California’s Central Valley and why HSR is taking off around the world. How did you become involved in the movement to bring high speed rail to America? How did high speed rail become an issue for you? I think it was from Walt Disney World in Florida. I grew up near there, with Walt Disney and his vision for cities of the future and future transport and the monorail and all that. And I’ve been sort of on that track ever since. Looking at our society today and our city planning and transport, I decided that this is an important area that I need to focus on. Why is high speed rail important? High speed rail is something that is basic infrastructure, and it’s the most efficient, smartest, best form of transportation ever invented any way you measure it since it started in Japan in 1964. What’s the biggest catalyst for green energy? How about a high speed rail system that needs electricity. What’s the biggest catalyst for slowing climate change? A clean electric transportation system replacing a dirty polluting transportation system. In an ideal world what does HSR look like? I’d say France, Spain, and Japan are probably some of the best examples. China is building a lot of high speed rail now too, but China hasn’t yet put the rail stations in the centers of their cities, which is a crucial part of making high speed rail work. Ideally, you want to have them in the city centers so that you can walk or ride a subway to the train, hop on the train, and when you get off at your destination, you’re already in the heart of the city. There are several universities that have been able to collaborate with other universities because they are linked by high speed rail. We call them clusters. Scientists at one university have more interaction with scientists at another that is connected by a high speed rail. Second-tier cities have been revitalized and end up becoming major destinations because they have access to the major cities. All kinds of things can happen. It’s very much a global economy that we’re in. Don’t U.S. businesses want high speed rail? They do. And most businesses benefit from this – whether you’re a shipper, have a thousand sales people on the go all the time, or have customers that need to get to you quickly. Transport is really the life-blood of the entire U.S. economy and right now it’s kind of like we have a hardening of the arteries. Where do you see the U.S. right now in realizing your vision for a national high speed rail network? Is California’s 2030 completion date for their high speed rail system achievable? In China, they built something like 8,000 miles of brand new state of the art high speed rail in four or five years. It’s unbelievable what they’ve done. Here in the U.S. we’ve been working on bringing in more private investments and I think that’s what’s really going to catalyze this – when some big money players decide to invest and start building some of these systems, then you’re going to see this thing take off like a rocket. I’m happy to see that the California system is being planned as a world-class state of the art high speed rail system — 220 mph speeds, fully electric, fully dedicated separate tracks for the majority of the run. That’s a world-class system and they are doing it right. They used Japan and Europe as a model and it’s impressive what they’re doing. It seems to me that freight rail is going through a renaissance in this country – wouldn’t it be great if we could get people to think that passenger rail is on par with our world-class freight rail system? I don’t have any doubt that the people will ride it. The battle is getting the system built. I have no doubt whatsoever the second you open one of these the public will be there lined up around the block to ride it because not only are they exciting and modern but they actually are the most effective way to get from point A to point B.
Joshua Marks is a volunteer guest contributor to TheCityFix. If you are interested in becoming a contributor, please contact us.